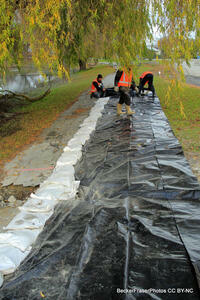 Sandbags laid along the banks of the Avon River, prior to building up the banks with gravel. 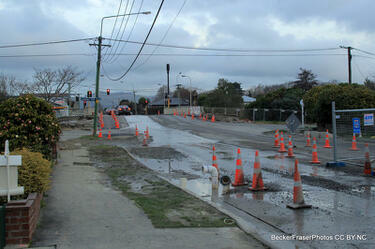 Liquefaction and flooding on Gayhurst Road. The road is lined with road cones. 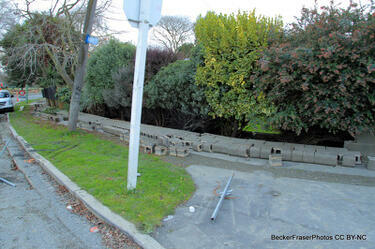 A collapsed concrete block fence in front of a house on the corner of Gayhurst Road and Dallington Terrace. Diggers on the former site of St Paul's School, now demolished. 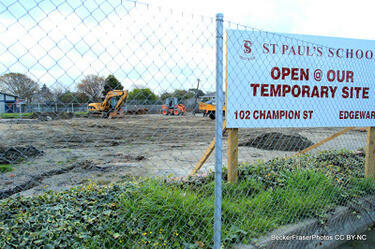 A sign reads "St Paul's School, open at our temporary site, 102 Champion St, Edgeware". 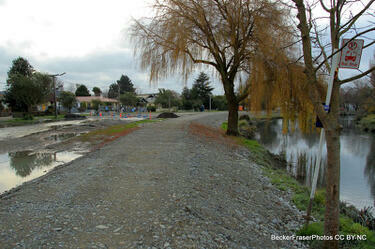 The banks of the Avon River along Avonside Drive have been built up with gravel. 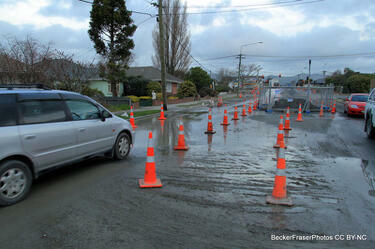 The street is flooded, and has been closed off with fencing and road cones. 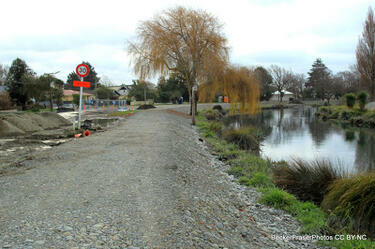 The banks of the Avon River along Avonside Drive have been built up with gravel. In the distance, portaloos and road cones can be seen. 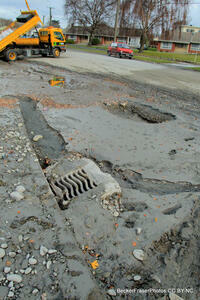 Damage to Avonside Drive. 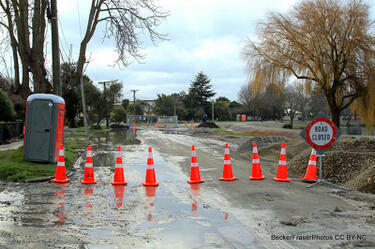 The street is closed off with cones and a "Road closed" sign, and portaloos line the street. 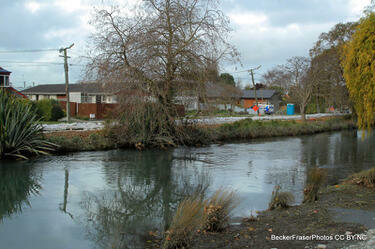 The banks of the Avon River have been built up with gravel. 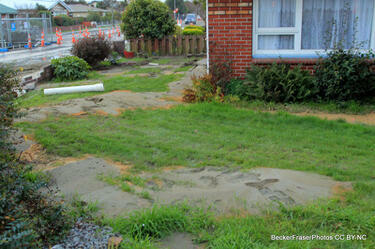 Liquefaction silt in the garden of a block of flats on the corner of Gayhurst Road and Locksley Avenue. 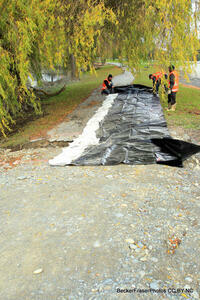 Workers laying sandbags and plastic sheeting on the banks of the Avon River along Avonside Drive, prior to building up the banks with gravel. 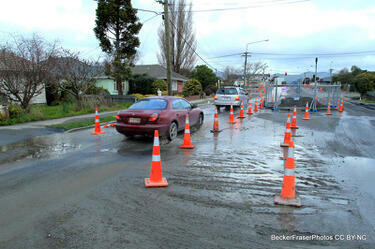 Cars driving through liquefaction and flooding on Gayhurst Road. The road is lined with road cones. 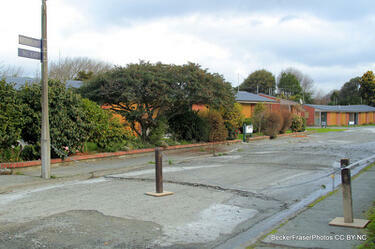 Damage to Bowie Place in Avonside. The road is badly cracked, and has been closed off with a chain. 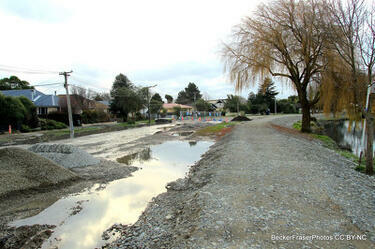 Liquefaction and flooding on Avonside Drive. The street is closed off with cones and a "Road closed" sign, and portaloos line the street. 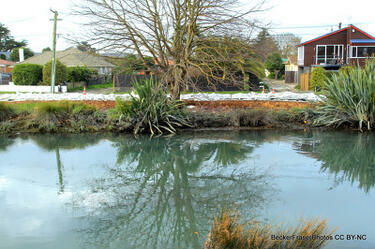 The banks of the Avon River have been built up with gravel. 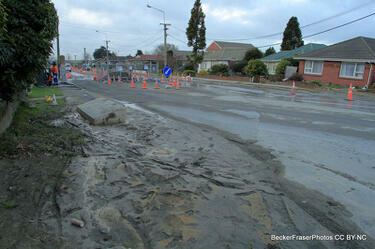 Liquefaction on Gayhurst Road. 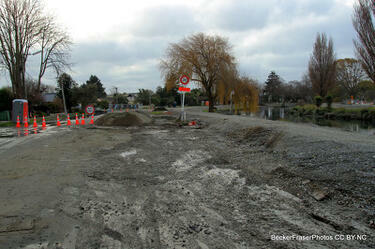 The footpath has slumped, and a road cone has been placed in the hole. 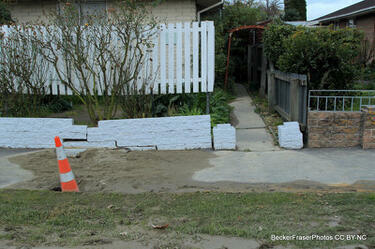 Behind, a low brick fence has cracked. 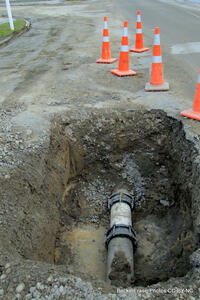 Road cones line a hole in Gayhurst Road, dug for pipe repairs.